Shopee announces 12.12 Big Christmas Sale, get deals for as low as PHP 12 only! Home / news / services / shopee / Shopee announces 12.12 Big Christmas Sale, get deals for as low as PHP 12 only! Shopee just announced the 12.12 Big Christmas Sale, the follow-up to their successful 11.11 campaign. Get deals for as low as PHP 12 only! 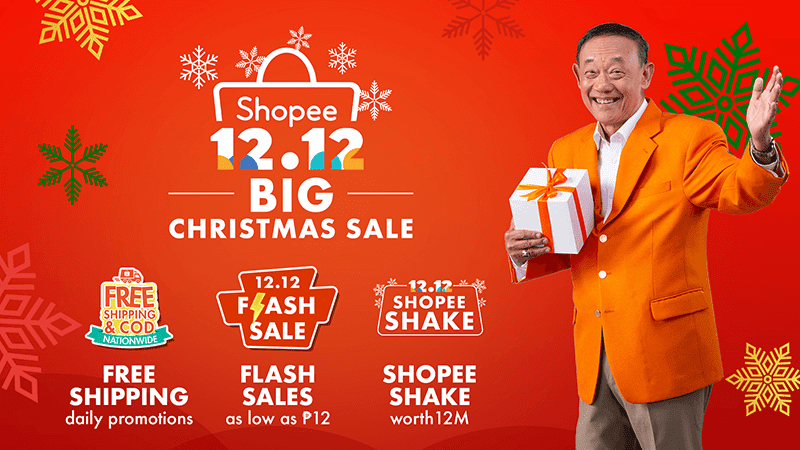 At the 12.12 Big Christmas Sale, Shopee users can enjoy deals for as low as just PHP 12, daily FREE shipping promotions, and exciting activities with Shopee's Christmas ambassador Jose Mari Chan. The 12.12 Big Christmas Sale will also include 16 themed sales in the lead up to December 12, Shopee Shake worth 12 million, and the launch of the new in-app game dubbed as the Shopee Quiz. Shopee's sale will also feature over two weeks of daily promotions up to 99 percent off. Shopee users will also get exclusive deals from brands like P&G, Maybelline, Vivo, SM Store, Silverworks, Unilever, Lactum, and Platinum Karaoke. The Shopee Quiz is an interactive live quiz which will require users to answer a series of questions to win. You can win a prize like hundreds of thousands of Shopee Coins. The quiz sessions will be happening daily at 9PM starting December 4 to 11. It will be live at 12NN and 9PM on December 12. The Shopee Shake is also back. It will happen twice daily at 12NN and 7PM throughout the campaign and eight times on December 4, 11, and 12. Shopee also partnered with Wish 107.5 to hold an exclusive bus tour with Shopee's Christmas ambassador, Jose Mari Chan. The Shopee Wish Bus Tour will make several stops around Metro Manila for live Christmas performance, games, and giveaways. Catch them at Starmall EDSA, Shaw; Ayala Triangle, Makati; and Market! Market!, Taguig City. Those who will spot and post a picture of the Shopee WiSh Bus on Facebook or Instagram could also get a special Christmas giveaway. To qualify, all you need to do is tag and follow @shopeeph on Facebook and Instagram, and include the hashtags, #ShopeeWishBusTour, #ShopeeBigChristmasSale, and #ShopeePH1212. To know more about the Shopee 12.12 Big Christmas Sale, visit this link.